We're taking care of the kids tonight! 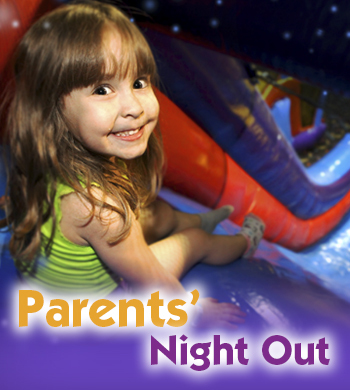 Parent's Night Out is made to give you a break and the only obligation you have at the end of your night (or before 10 PM.) is to pick them up and bring them home for bed. Pizza is catered, drinks will be served and activities like jumping on inflatables, making a special craft and watching a movie will be our itinerary!! FUN STUFF! Ages 4yrs-12yrs (Children MUST be potty trained)! $20 per child,$15 per sibling (payment due at time of registration) $5.00/15min charge for late pickup, per child. Sign up online, over the phone or in-store. Pre-registration is highly recommended. RESERVE NOW!!! $20 per child $15 per sibling.